Garden View: What’s in your soil? 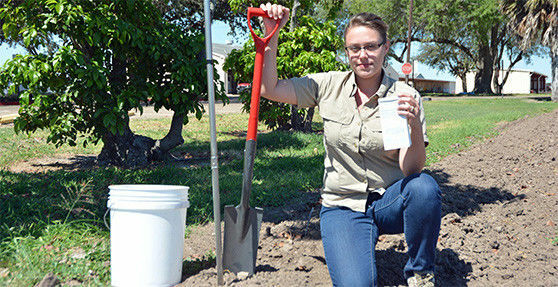 Ashley Gregory, horticulturist for Texas A&M AgriLife Extension, showing materials for collecting a soil sample. Are you planning a vegetable garden or putting in a cut-flower bed? If so, you will need to be familiar with soil, such as having the proper nutrient balance, fertilizers works for your garden and which to avoid. Soils anchor plants and provide nutrients, air and water to the roots. Combined with sunshine, air and water, soils play a critical role in the health of plants. Or, you may pick up a bag and instruction sheet from 9 a.m. to noon today at the Growing Growers Farmers Market. Master Gardeners are on hand to answer questions about soils and gardening at the market located in Firemen’s Park on the corner of 1st Street and Business 83 in McAllen. Complete the instruction form by identifying what you are growing. Choose from a list of plants — flowers, vegetables, turfgrass, trees and woody ornamentals, etc. List how many square feet of space you will be working with. On the reverse side of the form are instructions on where to collect your soil sample in the yard, what tools you will need, how to scrape away the plant materials and how to take a sample from about 6 inches deep. Additionally, you will find instructions on how to send the sample to the Texas A&M soil, water and forage testing laboratory. The biggest decision to make about sampling the soil is to determine what information you want, which will determine how much you will pay. The routine analysis costs $12. This test gives you information about how salty the soil is and its basic elements. The routine analysis plus micronutrients is $19 and provides valuable information about the presence of zinc, iron and copper. This is important in determining deficiencies in fruit and nut trees as well as turfgrass. The routine and detailed salinity is $34 and provides the basic information on how salty the soils are and the source of the salt. If you have had vegetables that just did not germinate, and you know the seeds are fresh, an abundance of salt could be the problem. Understanding what kind of salt is in abundance will be the first step in solving this problem. This is the test that I recommend if you are just beginning. Once you have filled the soil sample bag and completed the form, send it to the lab. Do not allow samples to sit for a long time. If the soil sample is wet, you can air-dry samples in a protected area on a clean brown paper if needed. Do not oven dry samples as this can alter results. For more information, call (956) 383-1026. Barbara Storz is a local horticulturist. You can listen to her garden show at 7 a.m. Saturdays on 710 KURV Radio, or contact her at bstorz@rcommunications.com.